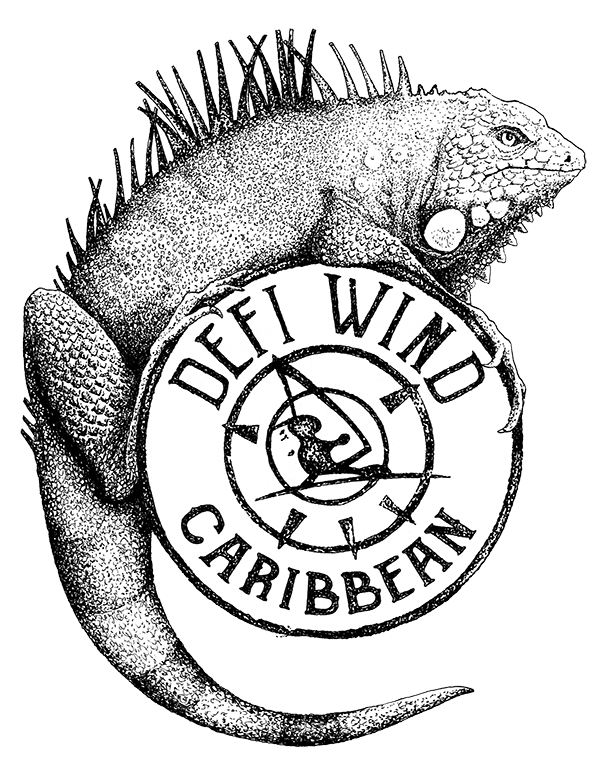 The third Defi Wind Caribbean had a perfect start today. Tradewinds were blowing strong around 20 knots all day long allowing the competitors to ride their medium wind’s gear. Defi Wind Gruissan’s winner didn’t let anybody else on the glory spot today. Nicolas Warembourg (FRA) won all three 12 km races today ahead of Ludo Jossin (ESP) and Aron Etmon (CUR). The 19 years old local boy had a good fight with the legendary Björn Dunkerbeck (ESP) on the water. 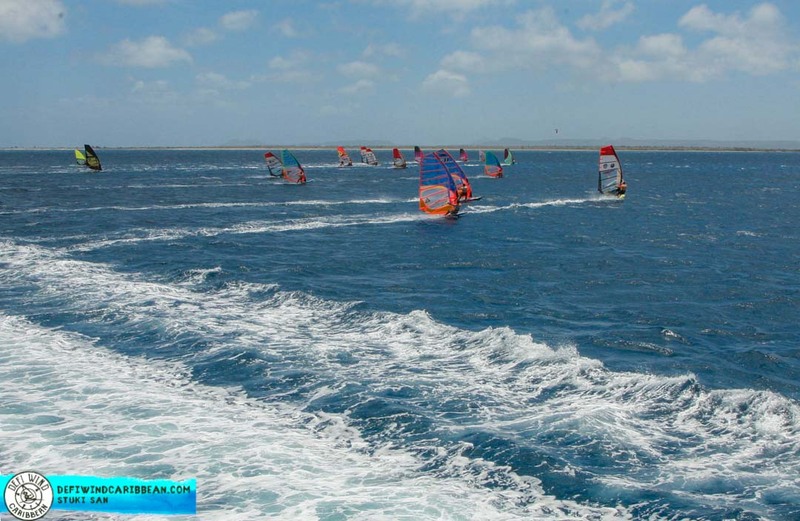 All competitors enjoyed going full speed over warm waters. 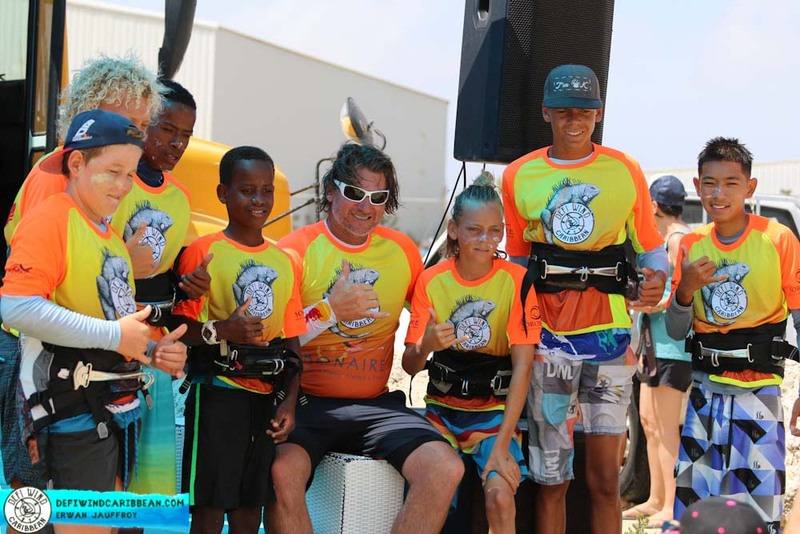 Smiles were on everyone’s faces all day long and especially for the numerous kids sailing alongside their heroes. After a perfect opening ceremony last night and a good party, the first skipper meeting was held at 8:30am this morning at Sorobon Beach Resort. 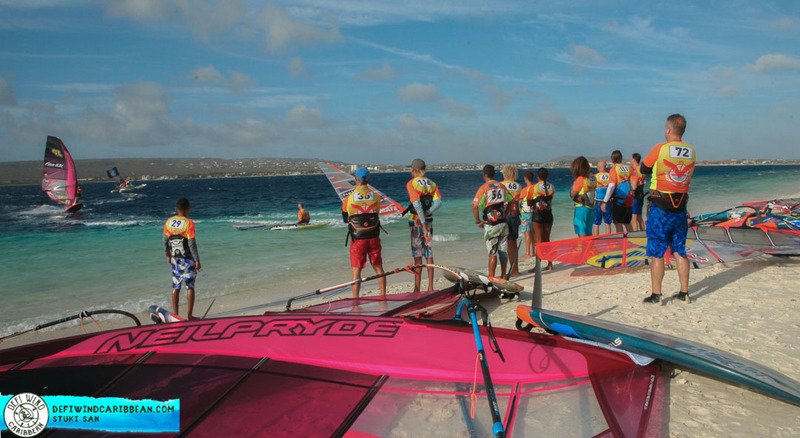 The call was made to bring every participants to Ti Amo beach for racing on the west side of Bonaire Island. Using the iconic Defi Wind Bus (former US school bus), riders and organising crew headed to the beach. While the course was set, everyone had the opportunity to get their gear ready and to share some times together and take advices from the pros such as Björn Dunkerbeck (ESP), Nicolas Warembourg (FRA) or Ludo Jossin (ESP). The large fleet of kids attending the event were more than happy to catch up with such riders ! Plus, for all of those coming from the US, France or Japan, riding in boardshorts with flying fish taking off at anytime in front of your board is always exciting. The two first races were 12 kilometers long, on an in & out format of two laps between Ti Amo beach and Harbour village. 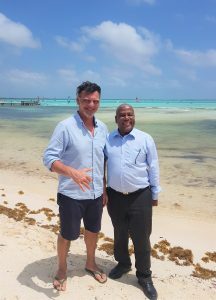 For the third race, race rirector Philippe Bru (FRA) made the call to go further downwind all the way to the beautiful No Name beach on the small island of Klein Bonaire. Frenchman Nicolas Warembourg won all races today but was given a run for his money by Ludo Jossin (ESP) very close behind him. Taking third place, Aron Etmon (CUR) has been quite impressive as well. At only 19 years old the young local managed to finish all races in front of 42 x windsurfing world champion, mister Björn Dunkerbeck (ESP) ! Behind this tops racers fight was tough as well and Christian Caumont (FRA) managed to enter the top 5. Depending on everyone’s goal, there were challenges at all stage in the ranking, sometime to overtake a friend or just for reaching the finish line. And that’s what Défi Wind is all about. While competition was tough on the water good vibes were shared ashore, no matter the ranking or the status!